Cryovac StratapacÂ® all-plastic lining square bottom bags are mainly used for the packaging of powdery and granular foods that require a high level of protection and sanitization. 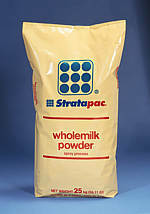 StratapacÂ® is generally used for products weighing up to 10-40 kg (depending on the food density) and has all the advantages that typical multilayer paper packaging does not have. The composite moisture-proof outer layer is strong and durable, avoids the common pollution of paper fibers and ensures food hygiene. The perforated opening facilitates quick opening and cannot be opened with other tools. The sealed inner bag can be quickly removed from the bag. The sealed inner bag can be quickly removed from the bag. . The all-plastic StratapacÂ® package simplifies the material recycling process and reduces waste generation by 30% compared to traditional paper/plastic multilayer bags. StratapacÂ® sealing equipment (developed by Avapac, a division of Niro) has the dual function of sealing and closing general multilayer paper bags and StratapacÂ® sealing advanced technology (easy opening function), and the packaged products are easy to open.